Norrebro Bryghus | Beer Apprentice - Craft Beer News, Reviews, Interviews and Info. Hello everyone. 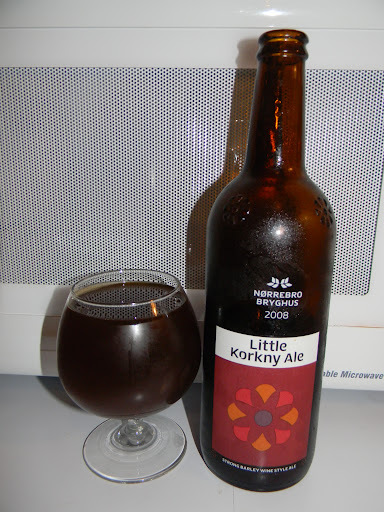 For today’s craft beer review I’m going to be trying a 2008 Little Korkny Ale produced by Norrebro Bryghus located in Kobenhavn, Denmark. I’ve only had one other brew from these guys, the North Bridge Extreme, and I liked it fairly well, so I’m really looking forward to test driving this one. The website, noerrebrobryghus.dk, was written in Danish, so I’m stepping over to ratebeer.com to find a commercial description of this particular beer. A very full-bodied beer brewed from ale and crystal malts. Strong 12.25% ABV with a pronounced sweetness and distinctive flavor of cascade hops, plums, and caramel. This one comes in a 20.3 oz. bottle and, according to the label, has an ABV of 12.0%. It poured a burgundy/brown color with a light tan head that was so fizzy that it dissipated about as fast as any beer I’ve ever seen. It left absolutely no lacing behind either. A few alcohol legs were noticed, but overall, I wasn’t that impressed with the aesthetic appeal of this beer. The nose presented a lot of sweet caramel malt. Tones of baked breads and quite a bit of dark fruit. Stabs of raisin, fig and plum. The fragrance was rather robust, but balanced fairly well. Not near as much alcohol as one would expect considering the high ABV either. The taste let the alcohol come out much more. The dark fruits (plum mostly) seemed to jump to the forefront as well. Still plenty of caramel and toffee sweetness was to be found though. This thing was extremely “big” and sweet. Almost too much so for me honestly. The mouthfeel was medium to full bodied. Smooth, chewy, dry and sticky. The carbonation was very low. A significant amount of warmth and burn was felt from the alcohol, which in turn, left a bunch of flavor behind on the palate after each sip. Well, I think the Norrebro Bryghus Little Korkny Ale was pretty good I guess. It was just a little bit tough for me to drink. A definite sipper that’s for sure. Easily a beer that I would much prefer during the cooler months. That’s not saying that you guys wouldn’t love it. You may very well think it’s outstanding, and that’s great, but for me it just didn’t set well during my tasting. I figure I need to try it again in the future and give it another chance. I’d suggest picking it up and giving it a go for yourself though. Be sure to let me know what you thought of it. I’d love to hear a second opinion. Hello everyone. 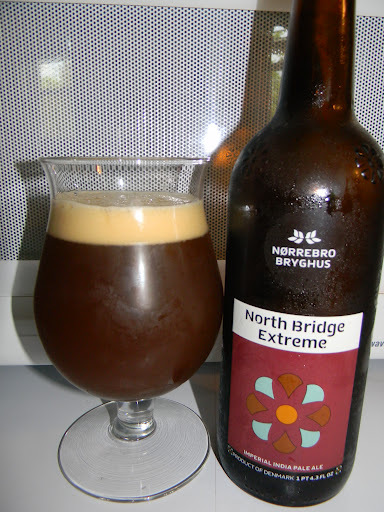 For today’s craft beer review I’m going to be trying the North Bridge Extreme produced by the Norrebro Bryghus located in Kobenhavn, Denmark. I, honestly, had never even heard of these guys and when I saw a bottle or two sitting on the shelf at the bottle shop that I frequently visit I thought I would give them a go. The website, noerrebrobryghus.dk, was written in Danish, so I had to revert to ratebeer.com to find a commercial description of this particular brew. Danish: North Bridge Extreme, was a present from the brewers to Brew master Anders on the first anniversary of Nørrebro Bryghus. Inspired by the Southwest Californian triple IPA’s, it is brewed with British ale malts, adjusted with several colour malts and spiced with extreme amounts of hops. A dark golden extremely bitter ale (9,5 % ABV) with a prominent hop aroma. Should be enjoyed as the final beer of the evening – Your taste buds will no longer function after drinking this ale! This Imperial IPA comes in a 20.3 oz. bottle and it has an ABV of 9.5%. The North Bridge Extreme poured a murky, deep brown to caramel color with touches of ruby dancing around the edges. The crown was light tan and decently sized. The texture was a mixture of soapy and creamy with both large and small bubbles throughout. The retention time was so-so, but the lacing looked pretty good I thought. It left several patches of foam all along the sides of the tulip glass. The nose brought forth a very strong malt presence combined with heavy hints of dark breads and toffee. Scents of raisin and sweet molasses as well. A very light hint of booze hid underneath. Earth and pine provided a nice take on the hop profile. This brew smelled very similar to an American Barleywine in my opinion. Overall, very well balanced and complex for an India Pale Ale. The taste let loose more of the dark breads (wheat) as well as some toffee and caramel sugars. I got a slight taste of rum too. As the beer warmed I began to distinguish a very nice savor of fresh peanut brittle. The bitterness seemed to come on a bit stronger as it warmed also, and again, piny and earthy hops tickled the taste buds of this rather rich and bold flavor. The mouthfeel was medium bodied. Very dry, chewy and sticky. A minor touch of warmth was felt at the back end. The carbonation seemed a bit low, however a great deal of flavor was left behind long after the sip. Personally, I think we have a very nice beer right here. It’s not your typical Imperial IPA that’s for sure. Like I mentioned earlier, it seems a little more geared to the American Barleywine style. That’s quite alright with me though, because I love American Barleywines. The heavy malt delivers a great deal of sweetness, although the drinkability remains quite high. It’s not a beer to rush through in my opinion anyway. One needs to sit and let this beer breathe a bit to really gather all the subtle nuances like the earth, peanut brittle and pine. I’ll say that I wouldn’t have a problem recommending the Norrebro Bryghus North Bridge Extreme to anyone looking for a different take on the style that’s for sure. If you are able to obtain this brew, pick it up and give it a try. I would be interested in hearing what you think about it. Be sure to leave a comment and let me know. Thanks for reading everyone. Feel free to leave feedback at any time. I enjoy the interaction.